Muslims for 9/11 Truth: Is Thierry Meyssan, the original 9/11 trutheur, converting to Islam? Is Thierry Meyssan, the original 9/11 trutheur, converting to Islam? According to a report at the French Muslim website Oumma.com, Thierry Meyssan - the respected left-leaning intellectual who shocked the world in 2002 with the news that 9/11 was an inside job - is converting to Islam. 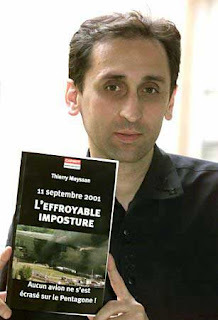 Meyssan, whose book L'éffrayeuse imposture (9/11: The Big Lie) set French publishing records in 2002 and made him a controversial figure, is reported to be planning an event this weekend announcing his conversion to Islam alongside three other prominent anti-Zionist French intellectuals - Alain Soral, Dieudonné, and Paul-Éric Blanrue. According to the Oumma.com report, Meyssan and the other new converts are arranging the public event to announce their conversions in order to strike a blow against Islamophobia: "The club of anti-Zionists has decided to deliver a huge kick to the Parisian Islamophobic anthill and make its blood boil."